On November 29th, a car crashed into an LA Fitness in Mesa. The details are still coming in, but ABC 15 reports that “a man rammed his vehicle into another occupied vehicle in the parking lot of LA Fitness at Stapley and University drives. According to police, the suspect hit the vehicle twice and, in the process, hit an outside pillar at the gym.” The person whose car was hit sustained no injuries, and the person who hit the car was taking to the hospital with non-life-threatening injuries. No one in the gym was injured, either. There have been a couple stories like this in the news this year, where vehicles crash into buildings. But what do you do when that building is your home, and someone crashes into it? Who pays for the loss – and what happens if someone gets hurt? First things first: if a car crashes into your living room, the driver’s car insurance will cover the damage – but only up to the specific policy limits. In Arizona, that means if the driver has the bare minimum coverage, you can only collect $10,000 for your property loss; if he or she has no insurance, you won’t be able receive anything. 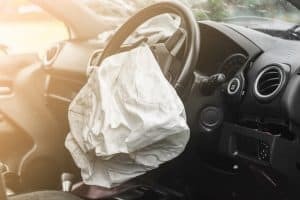 If this is the case, you have two options: you can turn to your own homeowners’ insurance to cover the difference, or you can sue the driver to recover the damages. It is worth remembering, though, that a person who is driving without insurance may not be able to come up with the money, which means seeking reimbursement through your own homeowners’ insurance might be the best (and only) solution. If you lease or rent your home (or an apartment on the ground floor), you should have rental insurance. However, your policy will only cover your personal property; your landlord’s insurance policy will cover the costs associated with the damage to the structure (your physical apartment), but it won’t cover the loss of your belongings. If the driver was uninsured and there was no injury, the claim should go to the premises coverage. After paying for covered losses that company will sue the driver. If they collect, you’ll get your deductible back. Arizona also requires drivers to carry bodily injury liability coverage, with a minimum of $15,000 per person, and $30,000 per accident. So, if you are sitting in your living room when a car comes through the walls, and you are hurt in the process, the driver’s bodily injury liability insurance can be used to pay for your medical treatment, your hospital bills, your lost wages, and suffering. (Your health insurance should pay for you medical care, but in some circumstances, you may have to reimburse them all or part of what they paid if and when you collect from the driver.) You can also collect from your UM/UIM coverage, which covers your injuries when you’re hurt by a negligent uninsured or underinsured driver, whether you are on the road or snug in your living room. If, however, the policy limits do not cover your injuries in full, or if you only have the minimum UM/UIM insurance ($15,000/$30,000), you may still run short when it comes to your injuries. In 2014, a stay at a hospital in Arizona averaged between $1,965 and $2,581 per day – and that only included expenses incurred by the hospital for your care. Get as much UM/UIM coverage as you can afford – it protects you and your family. Cars don’t crash into buildings all that often, but when they do, you want an attorney who understands what is happening, and who will work hard to make sure you get what you need. At Plattner Verderame, P.C., we represent clients in Phoenix and throughout Arizona who simply want to get back to their everyday lives. You don’t have to fight the insurance companies alone. Please call 602-783-8793 or fill out our contact form, and learn more about how we can help.